Dean Fowler is an Investment Analyst with Anacacia Capital. 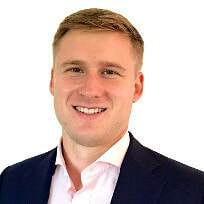 He is responsible for a range of activities including assessing investment opportunities and helping to research, contact, analyse and conduct due diligence on industries and new companies as well as assist with existing investments. Dean formerly worked as a Manager with Wholesale Investor assisting to intermediate capital and private companies. Dean has a Bachelor of Arts majoring in Economics and Business Administration from Hartwick College in New York where he was a Full Scholarship Recipient and played for the Hartwick Soccer Division 1.